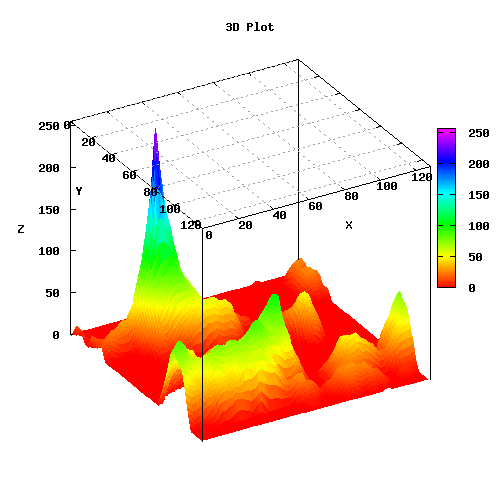 Generates a 3D plot of a single channel or grayscale image. PURPOSE: To generate a 3D plot of a single channel or grayscale image. DESCRIPTION: PLOT3D generates a 3D plot of a single channel or grayscale image. The plot will be in pseudocolor or line format. 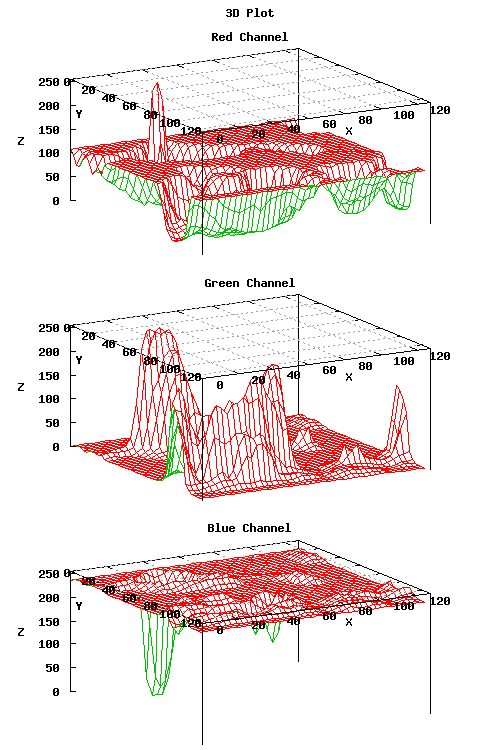 A color image may be used to see each channel plotted on the same graph. -w width ... WIDTH of output image. The default=500. -h height ... HEIGHT of output image: The default=500. -c channnel ... CHANNEL of input image to use. The options are: red, green, blue, alpha, cyan, magenta, yellow, black, gray, color. (gray is image converted to grayscale). (color is full color image; format=1,5 only). The default=gray. -a autolevel ... AUTOLEVEL is used to apply -auto-level to the input image. Choices are on or off. The default=off. -ti title ... TITLE to use for the graph. The default is no title. -f format ... FORMAT (type) of graph to create. The choices are: 1 (pseudocolor), 2 (pseudocolor with image at bottom), 3 (pseudocolor with contours at top), 4 (pseudocolor with lines overlaid), 5 (lines only). The default=1. -s skip ... SKIP is the pixel skip amount for format=4 and 5. Values are integer>0. The default=3. -pn pan ... PAN angle for the plot. Clockwise rotation. Values are 0<360. The default=330. -tl tilt ... TILT angle for plot. 0 is face on to the image, i.e., looking down the z axis. 90 is the z axis in the plane of the output image. Values are 0<90. The default=60. -xy xyplane ... XYPLANE is the location of xy axes (and grid with tics and lines). Choices are: top or bottom. The default=top. -b box ... BOX around graph. Choices are: full, axes (only), none. The default=full. -tc tics ... show TICS. Choices are: on or off. The default=on. -lb label ... show x,y,z axes LABELs. Choices are on or off. The default=on. -g grid ... show GRID lines. Choices are xy, back, off. xy is only on the on the xy plane, back is also the back faces. The default=xy. -k key ... show palette color KEY. Choices are: on or off. The default=on. -p palettefile ... PALETTEFILE is the colorizing palette. Choices are RGB1, RGB2, gray user supplied text file listing the r,g,b colors. The default=RGB1. RGB1 colors (black, dark-violet, blue, cyan, green, yellow, orange, red). RGB2 colors (red, yellow, green, cyan, blue, magenta). The text file should be either 3 or 4 space delimited values in the range 0-255 (or 0 to 1) with one set per row. The first column can be left off if equal spacing of the colors is desired. It can also be simply a range from 0 incremented by 1 for equal spacing of the colors. 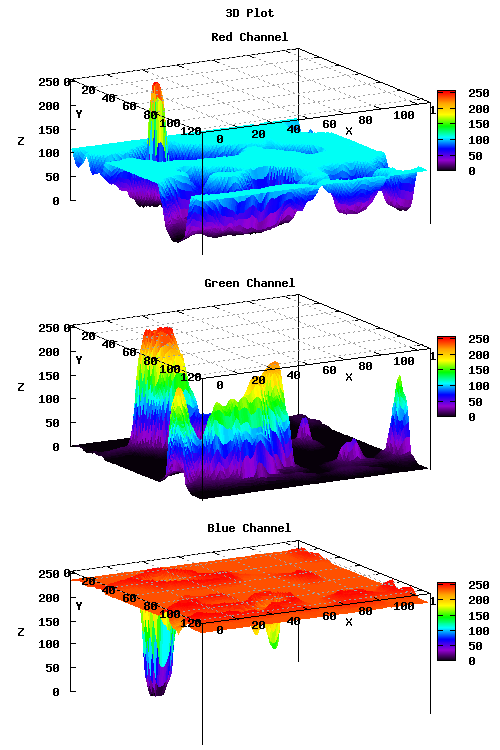 Otherwise, the first column is the intensity level where each color should show in the palette. -lc linecolor ... LINECOLOR is the overlay line color for format=4. 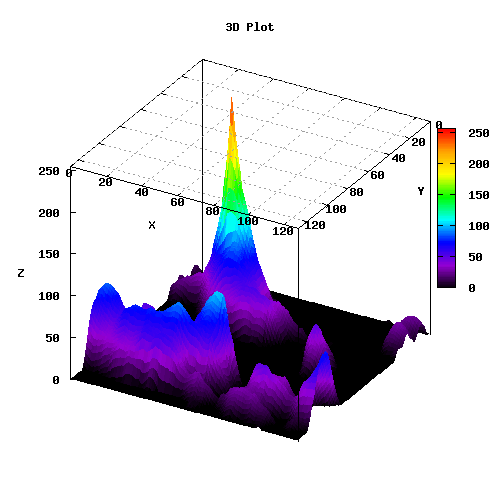 Values may be gnuplot colornames or hex values. The default=white. 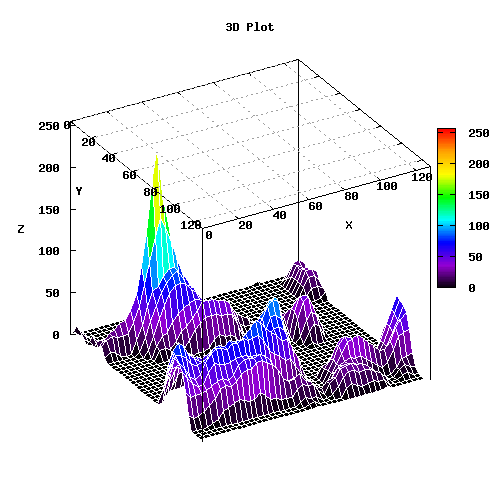 -xs xscale ... XSCALE is the scaling factor for the graph in the horizontal output dimension. Value are floats>0. The default=1. -ys yscale ... YSCALE is the scaling factor for the graph in the vertical output dimension. Values are floats>0. The default=1. 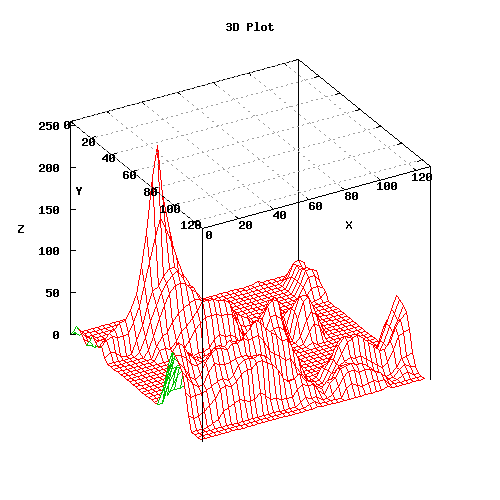 -xo xoffset ... XOFFSET is the offset for the graph in the horizontal output dimension. Value may be positive (up), zero, or negative (down) floats. The default=0. -yo yoffset ... YOFFSET is the offset for the graph in the vertical output dimension. Values may be positive (up), zero, or negative (down) floats. The default=0. 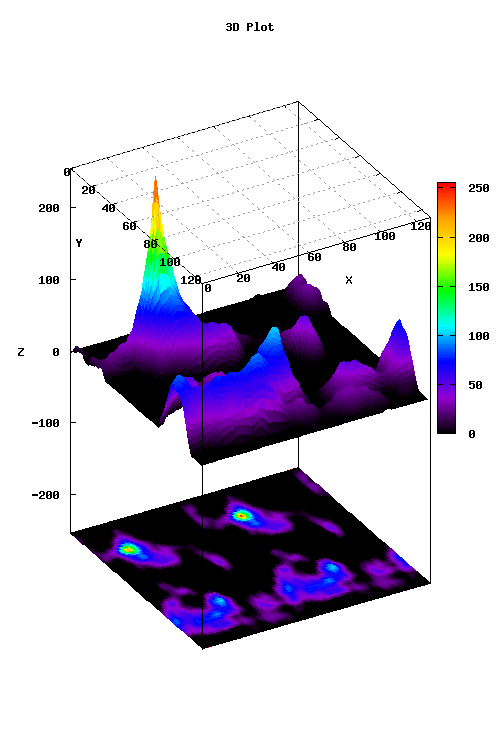 -z zlog ... ZLOG is used to apply log scaling to z (intensity) data. Choices are: on or off. The default=off. This argument is only valid for format=1,4,5. 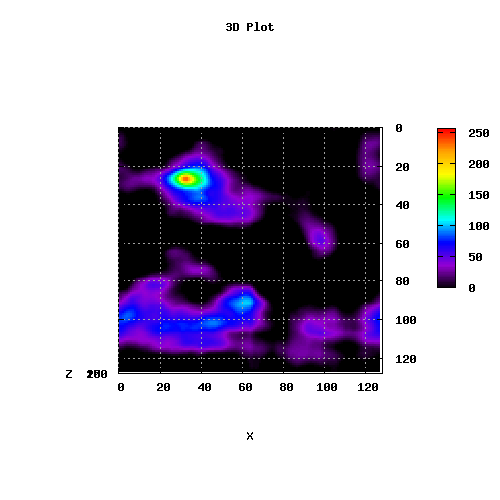 REQUIREMENTS: Needs GNUPLOT (4.6). I cannot guarantee it will work on older versions, but it may. Also libgd may be needed by GNUPLOT for proper rendering of fonts in PNG output. -f 3 -ti "3D Plot"